In 4 to 6-quart slow cooker, layer onion, beef and mushrooms. In small bowl, combine beef base, pepper, nutmeg and sherry; mix well. Pour over beef mixture. About 20 minutes before serving, pierce potatoes several times with fork. Place on microwave-safe paper towel in microwave. Microwave on HIGH for 10 to 13 minutes or until tender, turning potatoes over and rearranging halfway through cooking. Let stand 5 minutes. Meanwhile, combine sour cream, flour and ketchup; blend well. Stir into beef mixture. Increase heat setting to high; cover and cook an additional 5 to 10 minutes or until slightly thickened. To serve, lightly roll potatoes on counter to soften center. Cut potatoes in half lengthwise; place on individual serving plates. If desired, sprinkle with salt. Spoon beef mixture over potatoes. Sprinkle with parsley. Two 4.5-ounce jars of Sliced Mushrooms plus 1/4 teaspoon garlic powder can be used in place of the canned sliced mushrooms with garlic. Reduced-fat sour cream works equally well in this recipe and reduces the fat by about 4 grams per serving. To use sour cream from a larger container, measure 1 cup. 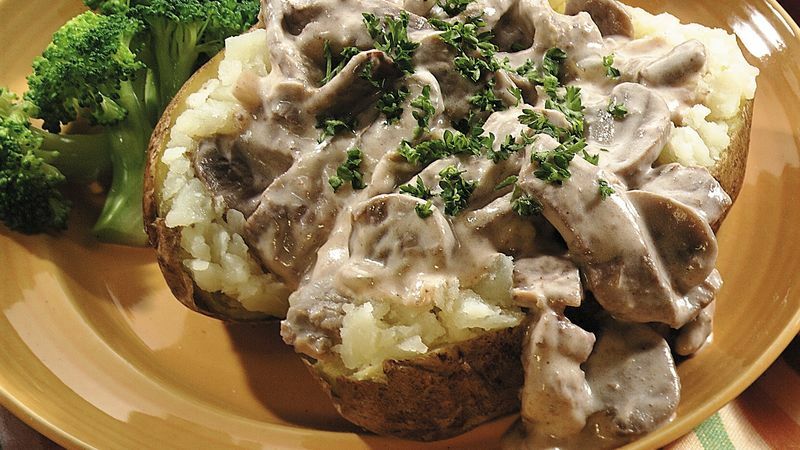 Cover any leftover stroganoff and refrigerate it for up to three days. Reheat it and serve it over rice, mashed potatoes or your favorite pasta.